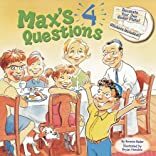 Max is the youngest of four brothers and lives in a house with four dogs, four parakeets, and four goldfish-so all the grown-ups are usually too busy to answer his questions. That is, of course, until Passover comes along and he gets to ask the four questions. Little ones will delight in this sweet, funny story that teaches them all about Passover with this lovable main character.